Whether a contentious election season has just ended, you are in the midst of one, or are on the cusp of one starting, the last thing you should be doing is talking politics at work. This is advisable even when a campaign season hasn't been fraught with controversy (a rare breed indeed). 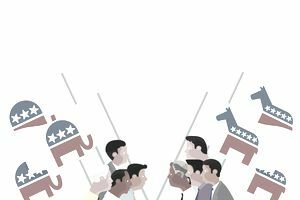 Why Should You Avoid Political Discussions in the Workplace? You may feel very strongly about your candidate. Why shouldn't you? The person you support for office shares your ideology. He or she has promised to put policies in place about which you have strong opinions. Everyone should love what your candidate stands for, right? This isn't always the case. Not everyone shares your ideology, and you could possibly damage any personal relationship you might have, not to mention your work relationship. You may also make other coworkers, even those who agree with you politically, uncomfortable. Perhaps most detrimental to your career, you may raise your boss's ire. Can Your Boss Ban Political Discussions? Your boss can put an end to your political discussions if they distract you and your coworkers from getting work done or cause tensions in your workplace. Your employer may even ban these conversations outright. In most cases, they are legally allowed to do so unless you and your coworkers are talking about labor-related issues that are defined as "protected concerted activity" under the National Labor Relations Act. These matters may include unionizing, wages, and working conditions. You may report infractions of this law to the National Labor Relations Board (NLRB), the government agency that enforces it. A few states protect workers from retaliation from their employers due to political affiliation or activity. Check the laws in your state if your employer fires you for expressing your point-of-view. What About Ranting on Social Media? You are, by all means, allowed to rant on social media to your heart's content. That doesn't mean there won't be ramifications for it. Your boss may see your rantings and terminate your employment unless the law in your state prohibits companies from doing that. If your coworkers can see what you share and say on social media, you run the risk of causing hard feelings between you and them. Speaking your mind may be okay in other parts of your life, but consider the amount of time you spend with your co-workers and the fact that you have to work alongside them daily. Think about that when you post something that might damage a productive working relationship. If you want to be able to speak freely, ramp up your security settings to block your coworkers and boss from seeing your posts. Journalist Cokie Roberts, in a Good Morning America segment about how to stay away from political discussions at family gatherings (November 23, 2016), suggested talking about dogs. Why not? Everyone loves dogs or at least most people don't have extremely negative views against them. Our canine companions can certainly serve as a go-to topic of conversation in the workplace in lieu of political talk. There are alternative things you can discuss. Just be sure to avoid other topics that don't belong in the workplace. Talk about your vacation plans: Are you going somewhere fun, or did you just return from a great trip? Your coworkers would love to hear about it. Share recipes: Tell your colleagues all about the delicious meal you made last night, or ask if anyone has a recipe for something you can bring to your neighbor's potluck. Recommend a restaurant: Speaking of eating, how about giving a review of that new restaurant you met a friend at for lunch. Tell them what you did last weekend: As long as your weekend plans didn't involve going to a political rally or campaigning for your favorite candidate, this is an innocuous topic. Talk about a great book you just read or a movie or tv show you just saw: Has a book you're reading been keeping you up at night, did you love the latest blockbuster you just saw, or have you been binge watching a tv show? Everyone can use something to entertain them, so go ahead and share. Don't gloat: No matter how thrilled you are that your candidate won the election, there is no reason to rejoice in front of your coworkers. Celebrate your candidate's victory on your own time. No one likes a sore winner. Don't pout: Sore losers aren't looked upon favorably either. If your candidate lost the election, concentrate your efforts on helping him or her, or your party, win next time. Leave your campaign attire at home: Your t-shirts or hats emblazoned with your candidate's slogan or face never had any business in the workplace during the campaign, and certainly shouldn't be there now.